As always when there is an issue Cavendish excel at keeping me informed as to what is happening and when it is likely to be resolved. I always feel like I am in safe hands. We have been a customer for a number of years, their service has always been absolutely first class. I would not hesitate to recommend Cavendish. It’s a great feeling knowing that you have a safe pair of hands looking after your comms and data. A bit like having International Rescue on your team. Comms are crucial to us so I’m so glad we decided to work with Cavendish. F.A.B! We have been with Cavendish for many years and their service is always 10/10. This is why we would never change supplier! Response and requests carried out both efficiently and promptly. Thanks for a good service when setting up our new system! Our issue was dealt with promptly and we were regularly updated. Before the support request was closed we got a call to check that we were happy that the issue had been rectified to our satisfaction. We have been very pleased with the personal service provided. Excellent service as always, all followed through and Cavendish were able to action my query straight away. Cavendish are launching a new Customer Referral Scheme, which means by helping us out, we’ll help you out. 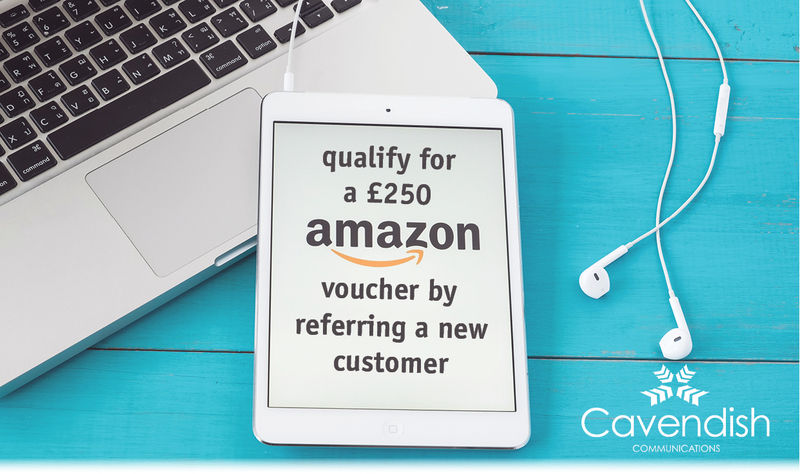 Simply refer us a new business customer who we haven’t previously quoted, and we’ll send you a voucher to say thank you. If you know of a local business that may be interested in our services, please get in touch with your Account Manager. 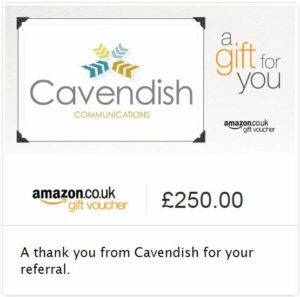 If they purchase a new phone system from Cavendish, you’ll receive a £250 Amazon voucher. Get in contact with your Account Manager today, alternatively enter your details below. * This scheme is exclusively for customers of Cavendish Communications. * This scheme is valid only for referrals from 1st October 2016.